Looking for a real adventure? 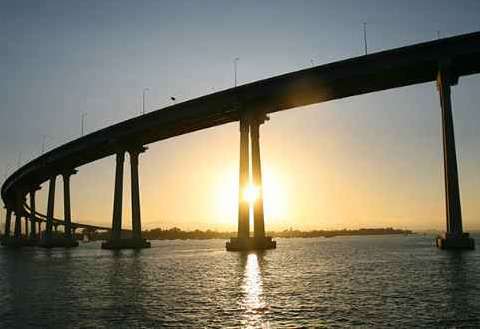 Book a San Diego Harbor Cruise at the Embarcadero San Diego and surprise friends and family. 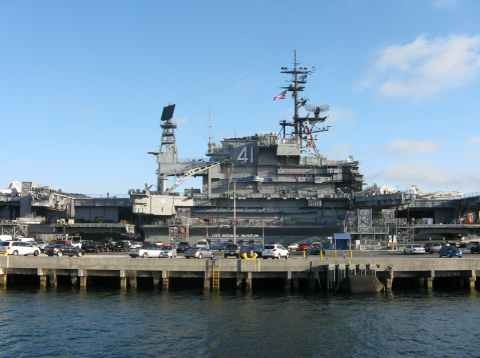 Everyone will enjoy a visit to the USS Midway Museum at Tuna Harbor Park as you stroll along the San Diego waterfront. You may even want to plan a day at the picturesque Embarcadero Marina Park North. With the first known use of the word dating back to 1846, Embarcadero, from embarcado and meaning to embark, my I suggest or better yet, ”Embark-I-Dare-You” upon the waterfront boardwalk in downtown San Diego. You will see the comings and goings of the large cruise ships as the Embarcadero San Diego is the homeport to Carnival Cruise Lines and Holland America while it shares its docks for embarkation and debarkation for Celebrity and Royal Caribbean Ships as well. It goes without saying that there is plenty to keep you and the family busy while strolling along the downtown San Diego waterfront at the Embarcadero San Diego. Begin your journey at the Embarcadero Marina and continue northward taking in the sites and fascinations as you explore to as far as the Maritime Museum. There are so many great things to do along the way. You may want to fit in a fun event that is taking place at the San Diego Convention Center or stop for refreshments and shopping at Seaport Village. We recently went on a San Diego harbor cruise at sunset. What a great way to see all the ships along the San Diego waterfront, views of SD from the bay, and cruise under the spectacular Coronado bridge. During December - mid April, you can also choose to go on a gray whale San Diego harbor cruise. For more information see Whale Watching in San Diego. 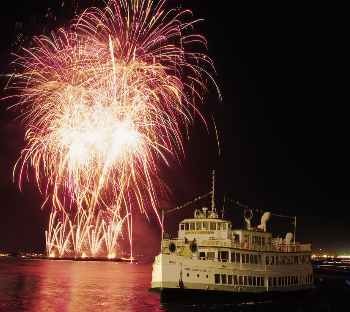 Discount Tickets for dinner cruises and 1 or 2 hour harbor cruises can be purchased from aRes Travel at some great prices. See arestravel.com. San Diego Hornblower Ticket Booth is located at 1066 N. Harbor Drive, San Diego, CA 92101 (619) 686-8715 and is open Mon – Fri from 8:30 a.m. to 7:00 p.m. You can also visit www.hornblower.com to view some of the vast array of cruises and events. You may even want to plan your next event, whether it is a company event, party or wedding. USS Midway Museum at Tuna Harbor Park is located at 910 North Harbor Drive, San Diego, CA 92132 (619) 544-9600. Prepare to spend from 3 to 4 hours touring this magnificent aircraft carrier boasting of its 60 exhibits and 25 restored aircraft. The Midway is proud to be known as the longest-serving Navy aircraft carrier of the 20th century. For a fun San Diego kids activity, see if you can spend the night on the USS Midway museum. This exciting adventure is open to groups such as YMCA adventure clubs and Boy Scouts. San Diego Seaport Village Dine waterside at one of the many Seaport Village restaurants and then shop the fun and unique boutiques including art, apparel and souvenirs. Take a ride on the carousel, as it is sure to please all ages. This outside shopping mall should be on your must see places in San Diego, and is located at the end of The Embarcadero. You can rent a pedicab to take you there for a romantic ride, or if your feet get tired. 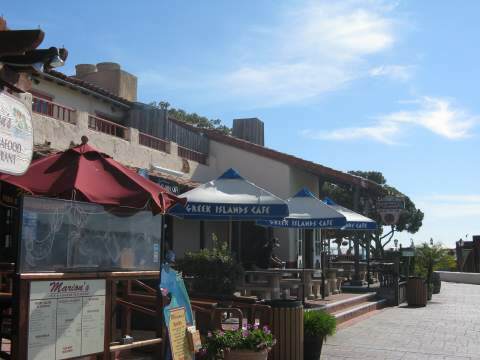 Seaport Village Hours: Seaport Village in San Diego is open Mon-Sun 10:00 a.m. to 9:00 p.m. The San Diego Convention Center is located at 111 West Harbor Drive, San Diego, CA 92101, (619) 525-5000. If you are planning an event you are sure to find a space to fit your needs within the 2.6 million sq. ft. of Interactive Floor Plans. The San Diego Convention Center is considered the prime conference facility for the region. For a listing of both private and public currents events at the San Diego Convention Center go to www.visitsandiego.com. Embarcadero Marina Park North is located at the foot of Kettner Blvd, (619) 686-6225 and is open from 6:00 a.m. to 10:30 p.m. With just a sample of the many amenities including bike paths, concessions, gazebos, picnic tables and the like, you will be able to enjoy the beautiful San Diego weather and view the Coronado Bay Bridge, Seaport Village, Harbor and so much more. Make this your day to get out to the Embarcadero San Diego and “Embark” on a new adventure while enjoying the foods, festivities and sites of the ever-so-inviting San Diego Harbor! The San Diego harbor is located in the heart of San Diego near the airport. Open the map below to see the harbor and other San Diego attractions.